Earthquakes are a part of life in southern California. The SCSN is an agency that seeks to mitigate seismic hazards through scientific comprehension of earthquakes. As we learn more about how earthquakes work, we learn more about how to deal with them. Due to its location on a plate boundary, southern California is continuously seismically active, as our many faults move to accommodate the northward progress of the Pacific plate relative to the North American plate. We are currently recording around 300 events every week, but this varies depending on the detection capabilities of the network and the seismic activity levels, as shown in the figure. Number of events recorded per week from 1932 to the present. Orange stars mark weeks where the number of events exceeded 1000, the maximum being over 5000 events in April 2010. Between 1970 and 1980 the seismic network was considerably expanded, and our number of detected events steadily increased from a few tens to several hundred per week as we began to record smaller magnitude events. 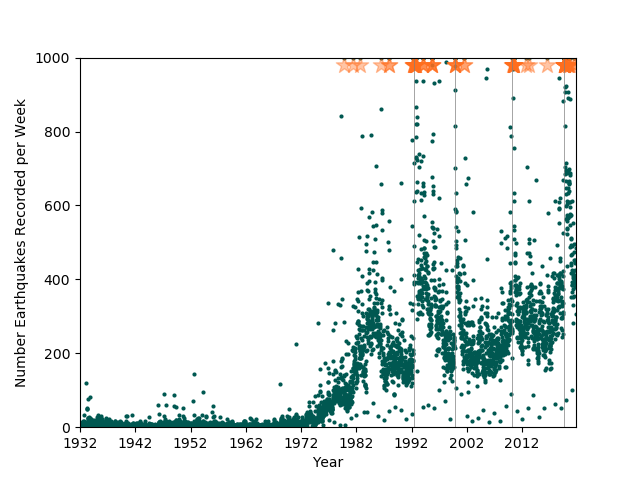 Significantly more events are recorded during the aftershock sequences of large magnitude events, such as Imperial Valley 1979 (M6.4), Landers 1992 (M7.3), Northridge 1994 (M6.7), Hector Mine 1999 (M7.1) and Sierra El Mayor Cucapah 2010 (M7.1). Minimum and maximum magnitude of events recorded each week from 1932 to the present. 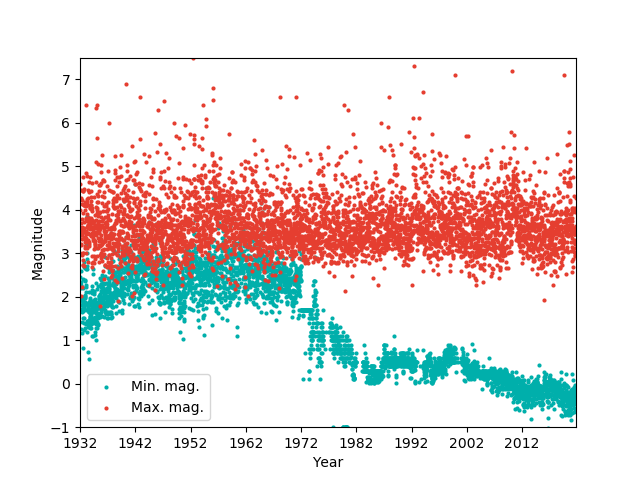 By contrast, the maximum magnitude of earthquake observed each week appears relatively consistent. Most weeks have a maximum magnitude between M3 and M4, the plot shows it is rare to have a week here in southern California without an M3 event. Events above M4 however are less common; we expect about 4 events of M5 or greater each year, and an M7 or greater event every 10 to 15 years. In fact this is the reason why we listen to the smaller events. In terms of the impact on people, we might only be interested in the larger events, the ones that we feel (starting around M3) and that may do damage (above M4). However, learning about faults by waiting only for the larger events would take a very long time. By recording and analyzing the small earthquakes, we learn about the location of faults and fractures, their style of movement and how active they are, all of which is used to help understand seismic hazard. If you plot all of the seismicity in the SCSN catalogue from 1932 to the present, you’ll see it covers most of southern California. However if we look at the event density (as in the figure), then fault traces begin to appear; these are the noisiest, most active features. Some of our most seismic zones are the San Jacinto and Elsinore faults and the area around Coso. You can also see the Newport-Inglewood and Garlock faults and sections of the San Andreas. However, it doesn’t necessarily mean that these faults are most likely to experience larger magnitude events, just that they are the most continuously active at lower levels. Event density map for all events recorded by SCSN from 1932 to the present. ShakeMap is an SCSN product that is a direct result of the science and technology that has been generated from earthquake research. ShakeMap Scenarios have also been created to model past and future events, affording first responders an opportunity to proactively design a response scenario for a major earthquake that may happen in the future. Earthquake Scenarios describe the expected ground motions and effects of specific hypothetical large earthquakes. In planning and coordinating emergency response, utilities, emergency responders, and other agencies are best served by conducting training exercises based on realistic earthquake situations, ones that they are most likely to face. Scenario earthquakes can fill this role; they can be generated for any hypothetical future or past historic earthquake. Left: Seismic waveforms collected from the SCSN and analyzed, determining event information. 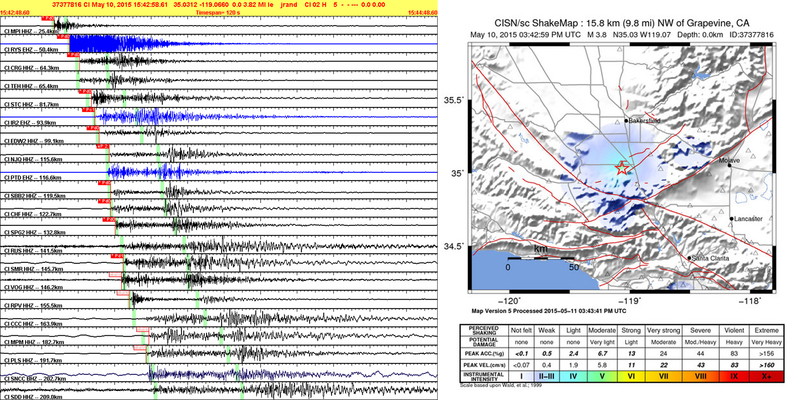 Right: Shakemap based on analyzed event data. ShakeMaps are calculated by assuming a particular fault or fault segment will rupture over a certain length, relying on consensus-based information about the potential behavior of the fault. For historic events, the actual rupture dimensions may be constrained based on existing observations or models. From this, ground motions are calculated at all locations in a chosen region surrounding the causative fault using empirical relationships.